VitaFeed Gold is a natural extract based on natural beet extract and molasses and is administered as a liquid feed. Developed over several years and thoroughly tested in field trials, VitaFeed Gold is becoming increasingly important in strengthening honeybee colonies in the face of the ongoing unexplained large-scale losses of honeybee colonies across the world. VitaFeed Gold stimulates colony growth and brood population in a controlled manner. VitaFeed Gold can be used at any time of year, but it is usually best administered in spring or autumn especially if colonies have been weakened by dysentery or related conditions. 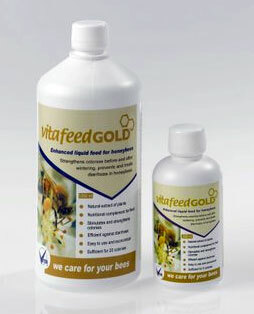 VitaFeed Gold is available in 250ml and one-litre bottles sufficient to feed five colonies. It is best applied mixed with sugar syrup in five sprinkled feeds over ten days.